Pointed nails are very much the height of fashion at the moment so i thought id post a few pictures for you guys to show you how pointed nails are a real great look for 2013 if your looking to try something new. Loved by many celebrities such as Rhianna, lady gaga and katy perry you too could get this great fashion fix. You dont have to be a wild as these celebs as classic colours look gorgeous on all nails as well as nail art. We offer a wide range of nails, styles, colours and nail art, if theres something you fancy that you have seen in a magazine then bring it along and we can be sure to create fab nails. CND BRISA HARD GEL- the strongest of the gel family and available for extensions, giving a glassy look, feeling lighter than acrylic but may not be as strong so not ideal for heavy handed clients. BUFF OFF only when removed. CND SHELLAC – also known as a power polish- a light gel polish giving your nails an instant manicure, sets in the UV lamp like a gel but looks and feels like a nail varnish. lasts 14 days. 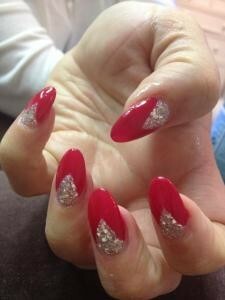 Available on natural nails and over acrylic and hard gels. SOAKS OFF in 8 minutes. Below are some examples of pointed nails with nail art, glitter acrylic and 3d bows but remember they look great plain too!